I remember sitting in a courtyard of a hotel in Paris with a beer in hand, and a book, when an American woman entered and began to talk to me. The hotel backed onto a major railway line that went from Gare Saint Lazare out to regional France, and trains would be regularly travelling past. The woman asked me if the trains would be doing that all night, though I suspected that the answer was no (particularly since the last train from Rouen to Paris left Rouen at 8:20 in the evening). However, it started me thinking that Paris is probably the only city in the world where trains rumbling past your hotel at 10:30 at night could be considered romantic, or was it just that these rumbling trains reminded me that I happened to be in Paris, not that I really needed all that much of a reminder. Yet, one does wonder if there is something romantic about railways. It makes me wonder at times because we are generally talking about some huge dirty, and incredibly loud, metallic machine that belches burnt coal out of huge chimneys and makes loud whistling sounds when the pressure in the boiler needs to be released. 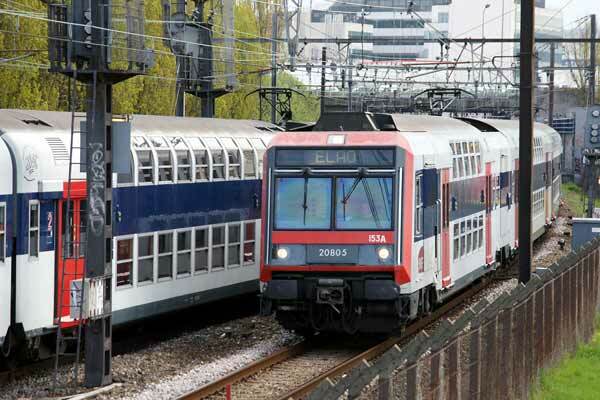 Or, they could be the ugly looking diesel engines, or even the electric trains where huge metallic pylons holding electrified wires criss-cross the city (or even the country side). Yet there seems to be a huge amount of fascination with these machines, to the point that if you type 'trains' into Youtube you will discover countless numbers of videos of trains stopping at stations, leaving stations, roaring past, or simply the sitting on the train as it travels from one end of the Metropolitan Line to the other. Mind you, I can't really criticise these people because my Youtube channel happens to be full of such videos, though I originally set the channel up so that my brother could watch train videos, though as it turns out he doesn't need to watch my videos to get a train fix (there are plenty of other train videos on Youtube to keep him happy). 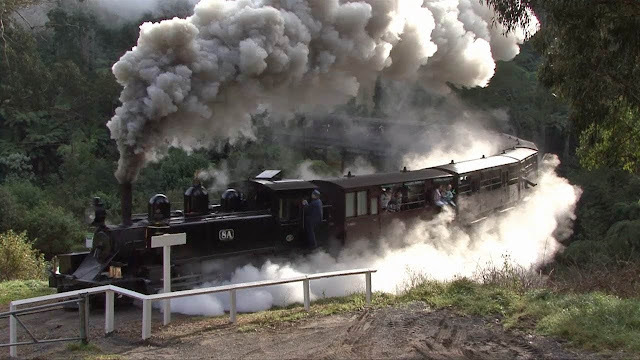 However, it was when people actually started subscribing to my channel that I ended up adding more and more videos of trains, which then made me want to go overseas so that I could add more than just videos of trains from in and around Australia, which meant more time riding trains, such as this one, in Germany. Mind you, one of the annoying things about the post 9/11 world is that one feels a little strange standing on a railway platform taking videos of trains as they arrive and depart - a part of me feels as if I am not careful the station security are going to jump on me and arrest me - and this is going to get worse and worse the more these terrorist thugs go around causing trouble. Mind you, despite attacks in Paris and Belgium, people still seem to be posting videos of trains up on the internet, including videos taken in the Paris Metro (and the London Underground). Mind you, there has probably always been some suspicion attached to people who film trains because before the era of Islamic terrorists there were Russian spies, and before the Russian spies there were German spies. In a way it seems more socially acceptable to stand at the side of the road and watch a bunch of imaginary characters dance past (while filming the parade nonetheless), or a group of people fighting over what is effectively a pig skin, than to sit at the side of a railway line watching trains as they roar past. However, this particular post is not really about train spotting, or an obsession with trains that I have picked up from my brother. Rather it is about a train that we went for a ride on when we were doing at the seaside resort of Victor Harbor. While I have already written a post on Victor Harbor I wanted to hold off writing about the train that runs along the coast for this blog, even though I have already written a couple of posts on some other railway museums that I have visited including the one in Ipswich in Brisbane and the one at Port Adelaide. Then there is the railway museum that I visited in Brussels, but since I have got nowhere near to writing a post on that museum (let along Brussels - so far I am only up to Amsterdam on my travel blog, and am still in Frankfurt on this blog), it is going to be quite a while until I actually get there. Anyway, even though I have previously written about trains, every post, and every experience, has something different about it, and I wanted to write something sooner rather than later. Anyway, the train that runs along the coast between Victor Harbor and Goolwa is known as the 'Cockle Train', namely because back in the days when it wasn't a tourist railway, people would jump on the train at Victor Harbor and travel up to Goolwa to collect cockles at the beach (actually, it sounds like it was a tourist train back then). However, that wasn't the reason that the railway was originally laid - in fact it is touted as being the first railway in Australia. The reason for this track was because Goolwa was positioned at the mouth of the Murray River, a major river that runs through South Eastern Australia, and the only river capable of conducting trade. However, the mouth of the Murray has a sandbar which means that ocean going ships aren't able to get to the docks at Goolwa. As such they built a railway first to Port Elliot, and then to Victor Harbor, two places along the coast which had sheltered harbours (and Victor Harbor was much larger than the bay at Port Elliot which is why the railway was eventually extended). The funny thing was that I had read a book on trains back at my parent's house (my Brother still has all our books from our childhood, so when I started writing reviews on Goodreads I thought it might be an idea to write reviews of all of the books that I read, and loved, as a kid. As it turns out some of these books are a lot longer than the three odd minutes that it takes to read a Mr Men or Doctor Seuss book, so I ended up getting bogged down a bit. However, one of the books that I did read was about trains - actually it was called Supertrains - and it went into details of how various trains worked, including the steam, diesel, gas-turbine, and electric trains. However, for the purpose of this post I will basically be sticking with the steam train, particularly since it was a steam train that we went for a ride on. While I had been down to Victor Harbor numerous times in my life I don't ever remember going for a ride on the Cockle Train. Actually, the cockle train is run by the SteamRanger Heritage Railway Society and it runs more than just a couple of steam trains between Goolwa and Victor Harbor. It used to actually run them all the way up to Mount Barker, but I suspect that the route between Victor and Goolwa was the most popular, which is why they eventually limited it to that spot. Also, they do have a number of other trains in their collection, but it seems that it is the two steam trains - the Duke of Edinburgh and the Dean Harvey - that are the most popular. For some reason I do remember sitting in one of the old carriages when I was much younger, though I suspect it was probably more of a restored carriage on a tourist railway (probably this one), than an actual commercial operation. However there were two types of carriages, the green ones and the red ones. While neither of them were comfortable compared to today's standards, it was clear from our experience that the green carriages were first class while the red carriages were economy (and the fact that there was a mail room in the middle suggested that this was were the not so wealthy travelled). However, even to go by train in those days you needed money, but then again when Victor Harbor was no longer a seaport, thanks in part to another railway line built to Adelaide, it became a seaside resort, which is what it is today. In fact, if you go for a wander around Victor today you can't help but notice all of the nice beach houses in the area. However, as we discussed, back in those days if you wanted to travel you either caught a train, rode your horse, or walked. Catching a train, or owning a horse, wasn't actually all that cheap. Even riding in a stage coach required some money, which meant that if you were poor, you either relied on your own two feet, or simply stayed where you were. I suspect that the original Cockle Train trek was an indulgence of the wealthy since I find it hard to believe that poor people would catch a train to Goolwa simply to collect shells. Mind you, once the road was built, and cars became accessible to the ordinary person (usually in the form of bank loans), Victor Harbor quickly went from being the abode of the rich to basically being the abode of anybody who wanted to get away for the weekend. 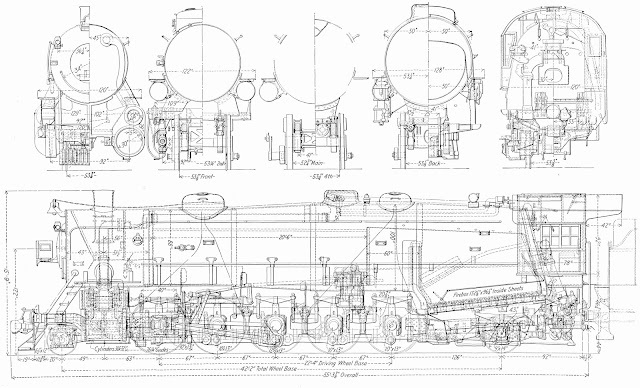 I probably should finish off saying a few things about how Steam Trains work, not that I am an expert on the subject. Actually, if you really want to know there is always this book called Supertrains (it is actually pretty amazing the detail that goes into some children's books, but then again I had books when I was a kid that taught me how to program a computer), otherwise there is always Wikipedia, which seems to be an endless fountain of knowledge, though I have discovered that if I want to find out specific things about Germany (such as the Hofgarten in Dusseldorf), I have to start reading German, which isn't easy at the best of times. The main problem with steam trains, and the reason why the volunteers than run the preservation society are so dedicated, is that it takes an awful lot of time to start the engine. It isn't like a car where you simply insert the key into the socket, turn it, and the car roars to life. With steam trains you have to heat up the water, and considering the size of some of these boilers, that takes an incredible amount of time. 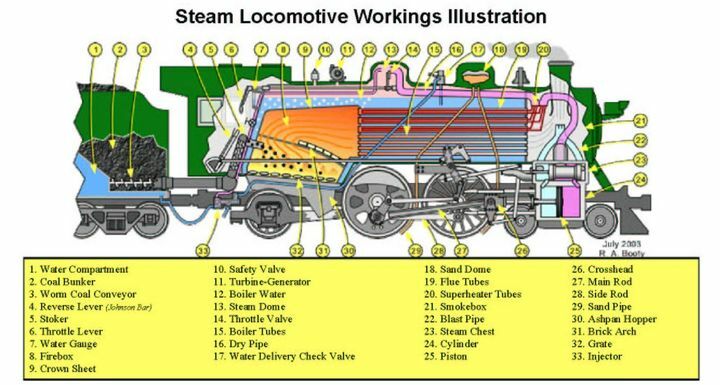 The other thing is that you have to keep the water heated because unless the boiler is producing steam then the train won't be going anywhere. The steam train, as suggested, works through producing steam, and the pumping the steam into pistons through the use of pressure. When the piston reaches one end the steam then escapes and going into the other end pushing it back, and the cycle thus begins all over again. As for the boiler, the water needs to be heated, and kept heated, and is where there is a huge coal bucket trailing along behind. However, in the early days of steam engines, when coal wasn't available, they would resort to using wood. However, due to the time it took to actually get the train operational, and the fact that you needed to keep the fires stoked, people were looking for other methods to produce motion. Another thing we saw was them turning the train around. This doesn't happen much these days because many of the engines are designed to be bi-directional, so all you need to do is uncouple them from one end and move it down to the other end of the train, and thus you have turned the train around. The other method is simply having the controls at either end of the train, which means that once you reach the end of the line the driver leaves his seat, locks the door, and heads down to the other end (after stopping for a coffee along the way). However, back in the days of steam things were a little more complicated, especially since having to tow a huge bucket of coal meant that simply changing sides wasn't really going to work. As such, they had to establish turn-abouts such as the one below, so that they could turn the train around. That also raises the question of the caboose, but I will leave it for this following video to explain it for me. Oh, and as for the land speed record for a commercial passenger train, that was set by a TGV train in France, though it was performed under controlled conditions, but at least the posted the video on Youtube.